If you’re here and reading this review, then I must congratulate you, because you are taking some time to do your research and you are interested to learn more about Affiliate Millionaire Club. Just like you, I’m also one of those people who are eager to know the best way to earn money online. When I came across their site, I was amazed by their claim. 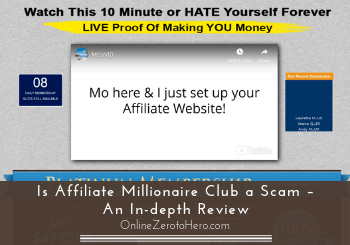 I was thinking, is Affiliate Millionaire Club a scam? Is it really possible to make $500 a day in just 5 minutes of work? For this reason, I decided to delve deeper, so I can gather some in-depth facts about their system. I’m here to provide you all the info about this affiliate product, so you can decide for yourself if they are the real deal or just move on to another affiliate opportunity. Affiliate Millionaire Club claims it’s possible to earn $500 to $1,200 a day through software generated affiliate sites. This claim is too exaggerated and a just one of the many red flags this affiliate product has. This is NOT how affiliate marketing works and this system is something that I cannot recommend. What is Affiliate Millionaire Club and what does it offer? When I first visited their site, I noticed that there’s no header logo or any branding that reference their name – Affiliate Millionaire Club. The first thing you’ll see is a big header encouraging you to watch the 10-minute video while in fact, it will run for about 20 minutes. Based on their claim, you can earn as much as $550 to $1,200 a day with just 5 minutes of work. Your profits will come from affiliate commissions, so this will require some sort of affiliate site. It’s not clear on what you need to do, but the program will include a software that will generate your affiliate site and some sort of basic affiliate training. Other than that it will do the whole process for you on autopilot. In my opinion, the claim is too good to be true. I’m an affiliate marketer for several years now and earning $550 a day on autopilot is not possible. I can safely say that it’s one of the major red flags I see with this affiliate product. There’s no automated way to make money online especially in affiliate marketing. However, based on the claims I have already shown you, it’s clear that upon joining this program they will create your affiliate site using an automated site builder. Since you’ve already done a bit of investigation about this product, and the fact that you’ve reached my review, it’s now time for me to show you the warning signs. I hope this can shed some light on what Affiliate Millionaire Club really is, so you’ll know what you’re getting into before joining their program. For most businesses on the web, it’s important to build your authority in your niche. That’s why companies are spending a lot of money on their branding because this will help them grow their business. It’s unusual for any type of business to hide their brand and just show a video of what they offer on their sales page. A lot of people are meticulous when it comes to online opportunities, so the normal way is to show who your company really is and get the confidence of your prospects. However, for Affiliate Millionaire Club it’s the other way around since they deliberately avoid branding. Basically, it’s another red flag because there might be a deeper reason why they are doing this. Did they had a bad reputation in the past? Who are they hiding from? We will never know since they are too shy to share their track record. Another thing I noticed from their site is the blue box on the left side of the video player. It says “08 Daily Membership Slots Still Available” and if you wait for a few minutes, you’ll notice that it will go down till it reaches 02 slots. When you reset your browser, you’ll see that it will comeback to 08 slots again. Obviously, the slots are auto-generated each time you reload their sales page. There’s also a blue box on the right side with scrolling names of their recent customers. But there’s no proof if these are real people. They haven’t provided a detailed info about them anyway, so I’m not convinced about the validity of these names in the scrolling counter. In fact, when you check their site after 24 hours, you’ll see the same names on the recent customer counter. If someone did bought in a particular day, then those people should be the ones on that counter the following day. Usually, this is a common method used by online marketers to engage prospects and is commonly known as scarcity tactic. If you’re not careful enough, you’ll most likely believe that their product is selling like hot cakes. Daily counters used for encouraging prospects to buy the product. But we’re smarter than they think. I know that you’re not easily fooled by such claims! Warning sign #3 – Who is Mo and what is he offering? If you’ve watched their sales video, you’ll know that the narrator’s name is Mo and he claims to be the founder of Affiliate Millionaire Club. He will also claim that he is a seasoned affiliate marketer who has been making millions since 2011. There’s no picture of Mo and what his full name really is. It’s like you’re being led into a story without even knowing the real name of the main character. It’s just Mo and he owns Affiliate Millionaire Club. 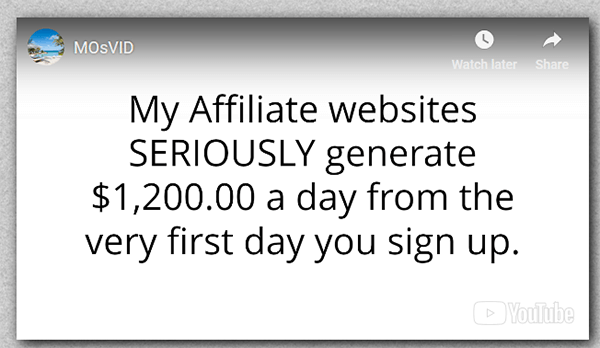 Another funny thing about his claim is the way he will show you how easy it is to earn money online. In fact, on the video he will create an affiliate site for his prospects so that means you, then he will show you that you’ve just earned $53 with the affiliate site he just built. A complete stranger has just given you $53 without you doing anything. It’s totally hilarious and one gimmick you need to be aware of. In their sales video, Mo said that their system is all plug and play, but in reality, it’s all about their website builder. Their software will do the rest and it will build your site in a matter of minutes. The real problem here is the quality of content on those generated sites. There will definitely be duplicates and you will definitely be flagged with plagiarism in the long run by the search engines. Affiliate sites need original and high-quality content that provides value to its visitors. Without unique and quality content, it will in the long run be more or less impossible to be found by people searching on Google. You can even risk Google penalizing your website for using techniques like this, so it is very risky to do and not an up-to-date way of working with search engine optimization and internet marketing. If you are not found in the search results, no organic traffic will come to your website. No visitors means no chance of earning money. Therefore this is NOT an approach I would recommend. How can you earn from those affiliate links if your site is nowhere to be found on the web? Warning sign #5 – Are those testimonials real? The first testimonial is from an old man who calls himself Steve, he will claim that he is earning $550 a day and it only took him 5 minutes to do it. Well, Steve is actually a freelancer in Fiverr and one of his gigs there is to impersonate a spokesperson for any company, that means he is hired to do these testimonials.